It probably doesn’t come as a surprise that when I’m not eating I’m drinking and when I’m drinking its gin. Interspersed between my recipes you’ll find gin cocktails such as Limoncello Gin Fizz, Sour Cherry Gin Slings and even a champagne cocktail flavoured with juniper, the botanical that makes gin, well, gin. 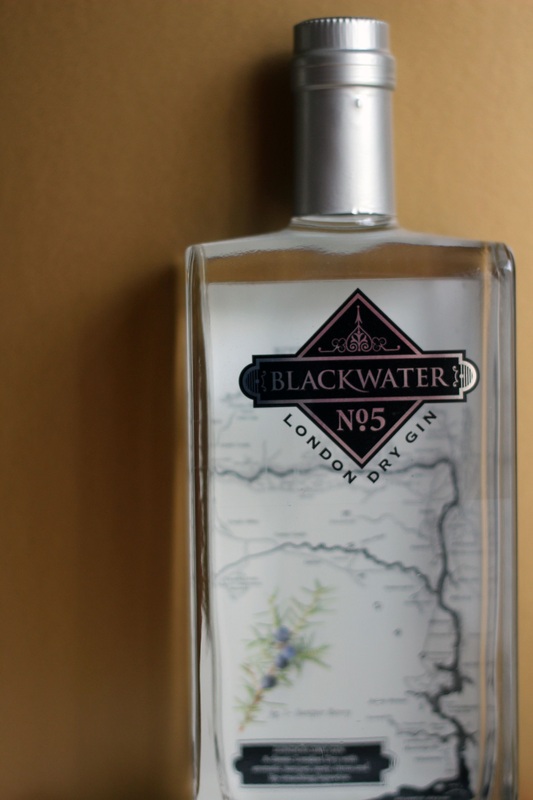 Today however I’m not sharing another gin cocktail recipe but instead I am reviewing a brand new gin – Blackwater Distillery’s Nº 5 London Dry Gin. The gin connoisseurs among you will know that a London Dry Gin doesn’t actually have to come from London. It’s not a geographic indicator but instead a London Dry Gins must be distilled to at least 70% ABV, must not contain any artificial ingredients, can not have any flavours or colourings added after the distillation process and can only include a tiny bit of sugar added at the end if at all. So, although it’s not remarkable that this London dry gin isn’t from London its place of brewing is interesting for another reason – the Blackwater Distillery is the first Distillery in Ireland to produce a craft gin! The first commercial batch only came off of the still on 9th February this year and I was lucky enough to win a bottle from the Craft Gin Club (more about them later). I couldn’t pass up an opportunity to share this exciting new gin with you so here are my first thoughts on this interesting, new craft gin. Blackwater No 5 is made from water from Blackwater River, also known as the Irish Rhine. What first struck me about this gin, both in terms of aroma and taste is how incredibly light and refreshing it is – you could seriously drink this stuff as easily as a glass of water. To say it is drinkable is an understatement. The flavour of juniper is pretty prominent. Although its quite a light and crisp gin, there is no mistaking that it is gin that you are drinking. You’ll also pick up a hint of liquorice, some coriander, and sharp, zesty lemon with helps to give a clean finish. Whilst I think this gin would work well in a whole host of cocktails I prefer to drink floral gins such as Blackwater’s Nº 5 in a simple gin and tonic. Personally I prefer a deep, spicy gin, something more like an Opihr or a Monkey 47. 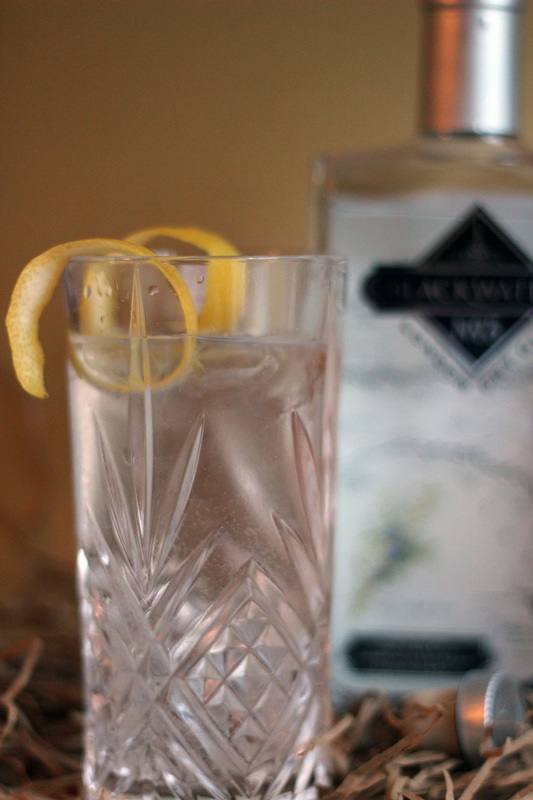 That being said, Blackwater’s Nº 5 makes for a really easy gin to drink on a warm summer’s day. Perhaps the perfect gin for a garden party? From a more superficial point of view, the bottle is stunning. The bottle is perfectly clear, with a sharp, glossy logo on the front. On the backside of the bottle is a white background with the path of the River Blackwater shown alongside an illustration of the juniper berry. The marketers and graphic designers on this product did a fine job of producing something which looks both stylish, modern and yet still sophisticated and like a premium product. I think it will appeal to the young “hipster” drinkers (as much as I hate to say it, like myself) and more seasoned gin drinkers. I mentioned a little further up there that I won this from a group called with Craft Gin Club. The Craft Gin Club is a members club for gin enthusiasts. It works by you (the gin lover) signing up to either monthly, bi-monthly or quarterly subscription. The club’s gin experts then pick the best craft, small batch gins and one will be sent to you either monthly, bi-monthly or quarterly depending on which membership you signed up to. You then get to sit back and enjoy the gin with a copy of the Craft Gin Club‘s own magazine which will tell you all about the gin you’re sipping on. Still, after winning this wonderful bottle of gin by chance I thought the gin lovers amongst us might be curious to find out more not only about Blackwater Distillery’s Nº 5 London Dry Gin but the company who made it possible for me to taste it so close to release of the first commercial batch. Because I won a bottle of Blackwater Distillery’s Nº 5 London Dry Gin in a competition. I am under no obligation to write a review, positive or otherwise by the Distillery or the company that provided it. Are you a gin lover too? I’d love to hear about your favourite bottles of gin. Have you had a chance to try Blackwater’s Nº 5 yet? Let me know in the comments below! Oooh We’re members of the Craft Gin Club, I totally agree about the Blackwater in fact I am sure we have another one arriving soon. We love gin so much here I built a gin bar. Good choice, excellent blog. A GIN BAR?! I am so jealous. I just have a crate haha. Much less classy. I do need to sign up to the club! I’ve never been able to enjoy gin – probably because I only ever try the cheap stuff! 😉 Must try some of the nicer varieties to see if I’m converted. Definitely do Becca. I think this is a great one to start with because it’s not too strong and is very refreshing. A good quality tonic helps too. I always recommend fever tree. Oh dear that mountain of debt doesn’t sound fun! Isn’t it a shame when sensible life decisions get in the way of drinking good gin. I don’t drink so I really don’t know but I guess the more expensive it is the better it will be to taste?? ?